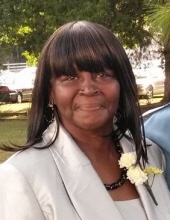 Esther Lee Ragland Hargrove, 68, of 145 Spring Valley Road died April 2, 2019 at her residence. Survivors include her children: Eugenia Blackwell, Philanderson Hargrove, Sr. and Clifton Hargrove; 31 grandchildren, 31 great-grandchildren and her siblings: Carrie "Bessie" Ragland, EJ Ragland and James "Jim" Ragland. A funeral Service will be held at 2 p.m., Saturday, April 6 st Coley Springs Missionary Baptist Church. Interment will follow in the Jordan Chapel Baptist Church Cemetery. Viewing will be from noon to 6p.m Friday in the funeral home chapel and at the church prior to the Service. To send flowers or a remembrance gift to the family of Esther Lee Ragland Hargrove, please visit our Tribute Store. "Email Address" would like to share the life celebration of Esther Lee Ragland Hargrove. Click on the "link" to go to share a favorite memory or leave a condolence message for the family.